How do I import video as a background in Carrara 8.5 pro? Can anyone tell me how I import video as a background in Carrara 8.5 pro? Thank you in advance. Thanks IamArtistX, I would like to work with video, since no plugin for after effects came with 8 or 8.5 pro. I know you can use a Flash animation, but I need to work with HD files. I am working with Windows 7. Hi BrianP21361, I imported the video as .avi, but it is out of phase. There's been a lot of posts in the forum about issues with avi's. Can you convert it to something else. Being on a Mac I almost never use avi. It may be the AVI Codec that is the issue. maybe try another one. If that doesn't work, then maybe try to convert the video to an image sequence. I know QT Pro can do this. So, assuming you get the video to work, you will probably want to load it into the scene's Backdrop. The difference between the Backdrop and the Background is that the Background wraps around the scene like a big sphere and can be reflected and used as a light source if Skylight is enabled. A Backdrop is displayed behind the scene in the production frame. It can appear behind atmospheres and such, but it cannot be reflected and cannot be used as an IBL. As I said above, a Background appears in the production frame, so it is important that the production frame is the same aspect as the movie or the movie will be squished to fit. To view the Background, you can set it to display in the Interactive Renderer. It is the icon at the top of the Assembly room window that looks like an up-arrow within a circle. Click it, and a new window will open. You can set it to display the Backdrop in the Assembly room. I know the AE plugin isn't included, but there are other motion sync options out there. SynthEyes comes to mind. Hi Evilproducer, thank you all for the great advise and help. I will look at changing the .avi codec, or working with a Targa sequence. I will have to use both the background and the backdrop as I want also to use the IBL. I will definitely look into the SynthEyes as an option. Again thank you all for the great advise and help. I've used sequenced images in the past so that should work. They work great as well! Since I usually do the final composite in my video editor, to save on memory as I'm still using a 32 bit version of Carrara, sometimes I'll use a lower quality version to set up my render. So an image sequence I would use .jpg for instance rather than .png or .tiff. A video would maybe also be something like a motion .jpg codec or a DVC codec with lower settings. I can't say with any certainty how much memory it does save, I just know it seems a little snappier in the Assembly room. There are several types of compression in .AVI, from DV to DivX… but for me, only the uncompressed AVI is accepted by Carrara. Me too... okay so it's not just me. I was trying to use the loss-less Lagarith codec, and Carrara just doesn't like it. I don't recall if that was true for playback or just rendering out. But I think it may have been both. So now when I want to go back and forth between Howler and Carrara, I use either full frames avi or Targa Sequences. Thank you all for the great advice. To update you all, like DUD_00001, I was successful with uncompressed .AVI . It seem that loss-less nor any of Blackmagic Design's codec works. I will try the targa sequence next time. As I have you guys ears, what codec you would recommend for 2.5k video files with Carrara 8.5 Pro. Never rendered that large myself. I would suggest rendering to an image sequence because even with a fast computer it could take awhile per frame depending on the scene. The advantage with an image sequence is that if Carrara chokes, you'll at least have frames up to the point it crashed, and can pick up where you left off. If you render directly to an AVI or Quicktime file, it will be lost. For simple quickie animations, I will just usually render out to Quicktime's Animation codec. For renders that are more complicated or time consuming, I'll render to an image sequence. Usually .png. Thank you for the heads up, I will go with image sequence. Thank you again. The format is really up to you. I just use png because it is lossless with a reasonable file size and supports alphas. 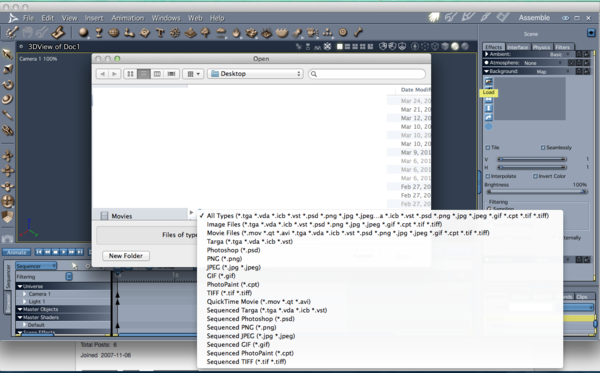 If you're using AE, there may be other formats (targa?) that you might prefer. It's what works best for you.